One of the biggest car makers Ford Motor has announced they will be stopping all Australian manufacturing plants by October 2016, after nine decades of making cars in the country. 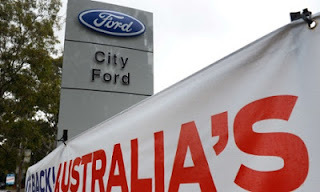 Ford Australia had lost a$600m ($580) over the past five years and faces costs double in Europe and four times of its Asian divisions according to the President of the co-operation Bob Graziano. He also announced the loss of about 1,200 jobs at the two plants in Geelong and Melbourne. The car makers have been under pressure with sales due to the strength of the Australian dollar which rose by 28% against the Japanese yen over the past year . "Our costs are double that of Europe and nearly four times Ford in Asia," Bob Graziano, the chief executive of Ford Australia, said. "The business case simply did not stack up." The closure is another sign of the weakening in the Australian labor market .From the budget released last week; unemployment is predicted to rise to 5.75% by the next fiscal year, which would mark the highest since 2009. Last year the Australian government announced to support the car industry with an A$5.4bn fund, including A$34 million to Ford Australia. According to the survey taken by the U.S Department of Labor, Australia’s hourly compensation costs in manufacturing was $46.29 in 2011, compared with $35.71 in Japan, $35.53 in the U.S, $11.65 in Brazil and $47.38 in Germany. Ford began assembling Model Ts at the Geelong west of Melbourne in 1925.